China produced 794,000 new energy vehicles in 2017, a substantial rise of 53.8% from a year earlier, including 478,000 battery-electric passenger vehicles, an upsurge of 81.7% year on year, and 114,000 plug-in hybrid passenger vehicles, up 40.3% year on year, 188,000 battery-electric commercial vehicles, rising by 22.2% year on year, and 14,000 plug-in hybrid commercial vehicles, decreasing by 24.9% year on year. In 2017, new energy vehicles made up 2.7% of China’s total production and sales of automobiles (output: 29.015 million units, sales: 28.879 million units), an increase of 0.9 percentage points over the previous year. New energy vehicle ownership approximated 1.53 million units in China in 2017, basically attaining the phased target of the Planning for the Development of New Energy Vehicle during 2012-2020. It is expected that EV sales will reach 2.11 million units in 2020 with EV ownership exceeding 5 million units. Driven by rapid development of new energy vehicles, the supporting facilities like charging station and charging pile also flourish. Charging station ownership in China soared from 76 in 2010 to 6,900 in 2017 at a CAGR of 190%. The number of public charging piles skyrocketed from 1,122 to 230,000 at a CAGR of 213.9% during the same period. In addition to public charging piles, private charging pile ownership reached around 245,000 units in 2017, thus bringing the country’s total number of charging piles up to nearly 630,000. (1) By the end of 2017, Beijing had built approximately 115,000 charging piles. There were about 80,800 charging piles for private use, around 18,800 charging piles for public use (in 2,070 open sites), and 13,000 charging piles in more than 1,500 charging/battery swap stations built for special purpose and in the public places owned by enterprises and institutions. (2) By the end of 2017, 129,986 charging/battery swap facilities had been connected to the municipal platform in Shanghai, including 25,707 pubic charging piles, 21,332 dedicated charging piles, and 82,947 private charging piles. Shanghai had a total of 161,748 new energy vehicles on a car-to-pile ratio of 1:0.81. (3) By the end of 2017, Guangdong had built 690 charging stations and 60,000 charging piles, including 38 intercity quick-charge stations and 120 intercity quick-charge piles at expressway service areas. As to industrial policies, China introduced a series of documents, such as the Circular on Issues Related to the Policy on Price of Electricity Used by EVs, the Circular on Rewarding the Construction of New Energy Vehicle Charging Facilities, and the Circular on Incentive Policies on New Energy Vehicle Charging Facilities and Strengthening the Popularization and Application of New Energy Vehicles during the 13th Five-year Plan Period (Draft for Comment), encouraging the construction of charging piles and allocating central fiscal funds to subsidize the provinces and enterprises which construct and operate charging piles in a sound way so as to stimulate enthusiasm of the society to participate in the construction of charging piles. 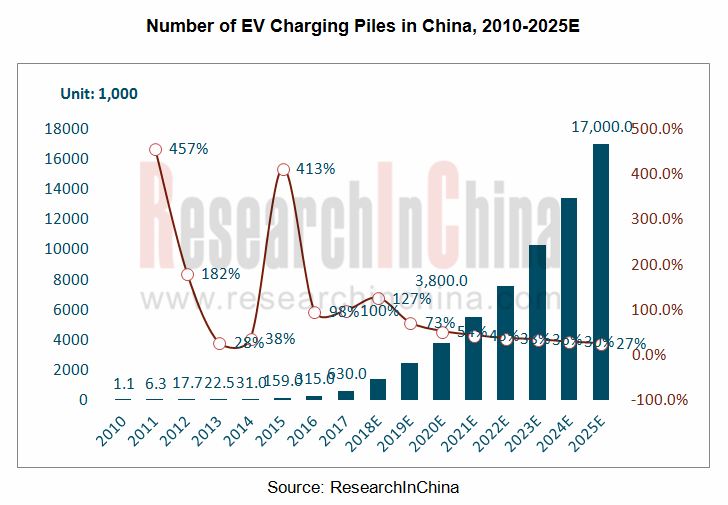 China aims to build 12,000 centralized charging/battery swap stations and 4.8 million distributed charging piles across the country by 2020 to meet charging demand of 5 million EVs in principle of 1 vehicle to 1 charging pile. Regionally, the EV charging stations that have been built are primarily concentrated in eastern provinces in East China, North China, and South China, of which Beijing, Shanghai, and Qingdao are the cities with massive construction of EV charging stations in China. Being incentivized by national policies on charging facilities, localities throughout the country have ramped up their efforts to build charging piles, and the companies that run charging pile business also announce to build tens of thousands of charging piles in Beijing, Shanghai, and Guangzhou. Operators of charging facilities, manufacturers of equipment, and providers of integrated solutions are three major roles in charging pile industry chain. There are three main business models in charging pile industry: “charging pile + commodity retail + service consumption”, “carmakers + equipment manufacturers + operators + users”, and “charging APP + cloud services + remote intelligent management”. 8.5 Suzhou Industrial Park Heshun Electric Co., Ltd.
8.6 Shenzhen Golden Highway Technology Co., Ltd.
8.7 Hangzhou Zhongheng Electric Co., Ltd.
Business Model of Shenzhen Chedian Network Co., Ltd. Centralized Charging Station Construction Plans of Shenzhen Chedian Network Co., Ltd. Distributed Charging Station Construction Plans of Shenzhen Chedian Network Co., Ltd.